Dhaka Abahani Limited got off to a flying start in the six-team Khawja Rahmatullah Club Cup Hockey Tournament outplaying Bangladesh Police by 7-1 goals in the inaugural match at Maulana Bhashani National Stadium here on Monday. 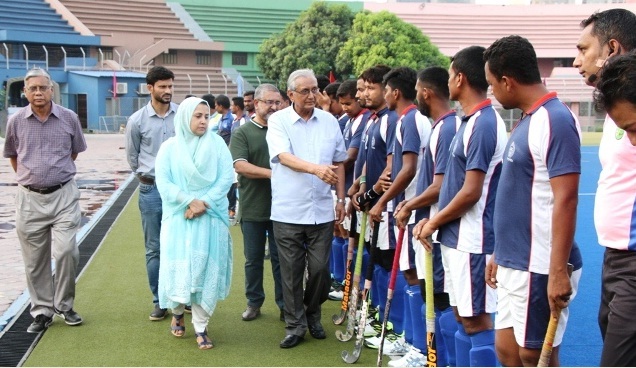 Prior to the day’s opener, General Secretary of Bangladesh Hockey Federation (BHF) Abdus Sadeque and Nadira Rahmatullah, wife of Khawja Rahmatullah, former general secretary and vice president BHF, were introduced with the players of both the participating teams. In the opening match, Mohammad Mohsin and Taher Ali struck two goals each while Rumman Sarker, Krishna Kumar and Ashraful Islam scored one each for the popular Dhanmondi outfit, reports UNB. Mahfuzur Rahman netted the face-saving goal for the Police. In another match, Dhaka Mariner Youngs Club crushed Victoria SC by 8-0 goals at the same venue. Hasan Jubair Niloy scored two while Mamunur Rahman Chayan, Moinul Islam Kaushik, Hasin Arman, Pushkar Khisa Mimo and Nayeem Uddin and Rezaul Karim Raju netted one each for the winners. Out of 13 metropolis premier division clubs, only six teams, excluding Usha KC and Dhaka Mohammedan SC, split into two groups are taking part in the eight-day competition, an optional hockey meet for the metropolis clubs. The participating teams are: Group A – Abahani Limited, Sonali Bank and Bangladesh Police; Group B -Dhaka Mariner Youngs Club, Ajax SC and Victoria SC.